There are a number of ‘teams’ of people on the JOIDES Resolution who all have to work together to make the expedition a success. There is the ship’s crew including the Captain and other mariners, the drillers and the maintenance crew of engineers, mechanics and electricians. Without them the ship wouldn’t go anywhere! Then there is the domestic crew from Entier who have done a wonderful job of keeping us fed, cleaned and clothed. 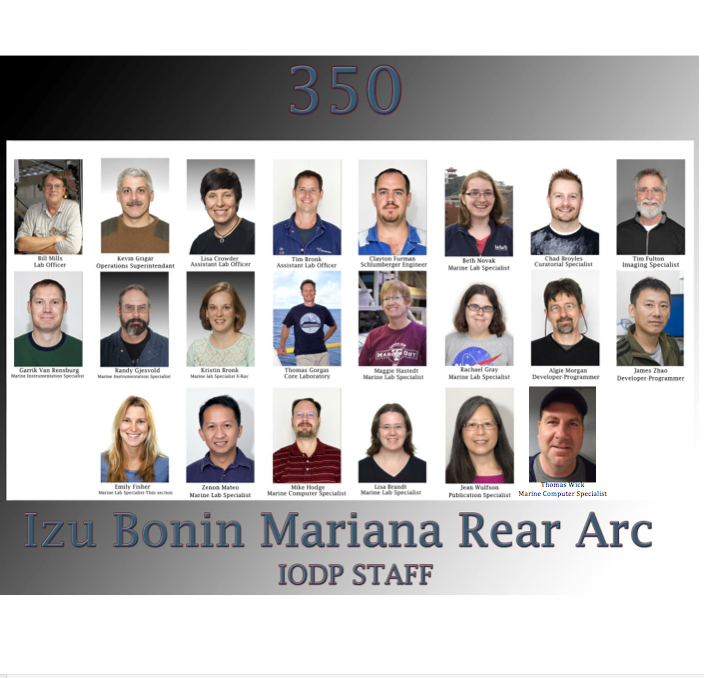 Also there is the ‘Science Party’ who comprise research scientists from universities around the globe and IODP, plus 2 Education and Outreach Officers. But before the end of the cruise I think we should celebrate the technical team –often the unsung heroes but absolutely crucial! They are a group of people who support the work of the researchers on the ship. Without them the science party would not be able to fulfill their roles. Most of the research scientists have never been on the JOIDES Resolution before. They come aboard with well-primed ideas about what they will be doing and how they want to do it, but they invariably need technical support to show them around, explain the idiosyncrasies of each piece of equipment, and generally make sure that the labs run smoothly so that the researchers can work unhindered. All the technical staff are highly qualified in science, engineering or other disciplines, plus they have worked on the JR for years, and this experience and knowledge is invaluable! The technical staff also do practical hands-on work – handling and cutting the cores, taking samples, entering data into spreadsheets and working alongside the scientists in the labs – testing samples and recording results – and generally keeping the labs clean, tidy and functioning! Other technicians have specialist training and knowledge in order to be able to carry out support functions, for example, making thin sections of interesting pieces of core for the petrologists, or feeding samples through the XRF (x-ray fluorescence) or ICP-AES (inductively coupled plasma – atomic emission spectroscopy) machines for the geochemists. Every single piece of material that is cored and brought up by the drillers is potentially important, so it is all carefully recorded and photographed before the scientists have access to it, and after they have finished it is wrapped and carefully stored ready to be sent back to one of 3 global repositories; most of this work is done by the technical staff including the curator and the imaging specialist. All the work that the scientists do has to be collated and documented appropriately in a form that is accessible to everyone and suitable for on-going use after the cruise. The documents that are produced are updated daily to take into account new data and information. Each cruise has a publication specialist to do this mammoth task! The scientists may also need specialist computer software to help them to analyse their results, and this can be developed onboard in direct response to the requests of the researchers. The computer system generally needs to be maintained and kept running at capacity with glitches repaired and queries answered. Again we have a brilliant team of people to help us out whenever and wherever help is needed. Much of the equipment we have onboard is very high tech and is used 24 hours a day! It is not surprising that sometimes it needs repairing or adjusting and all this has to be done as quickly as possible. To avoid sudden breakdowns, the equipment is subject to a general maintenance programme so the people responsible for this never have a moment to spare – they don’t just wait for something to break! And while we have a stock of replacement parts for most eventualities, occasionally the technical staff responds to a problem by conjouring up a completely new piece of kit from scratch – they are skilled craftspeople indeed! The technical staff are amongst the last people to leave the ship when it docks in port because they have to make sure the labs are absolutely spotless for the next teams to move into. And they often have cross-over meetings with their counterparts. Then some of the technical staff, for example the curator, continue to follow through with their work after they get back to IODP headquarters in Texas. And then in no time at all they are getting ready to come out on their next expedition to help a new group of scientists, always with constant energy and enthusiasm. The JR is very lucky to have such a wonderful tech crew on board! Well done and thank-you!